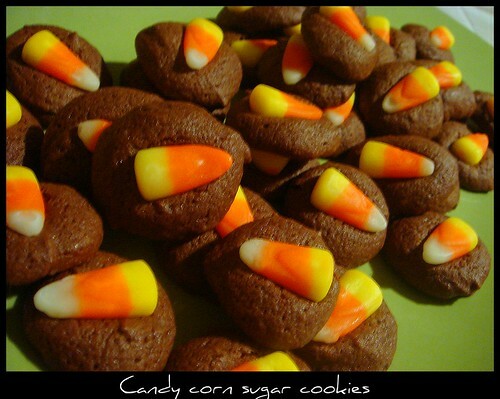 candy corn cookies, originally uploaded by Caudagali. Any leftover candy corn? You could save it for next year or, especially if the bag is already opened, make these incredibly cute little cookies! From Everyday Food, the recipe is for a simple sugar cookie dough that can also be turned into a chocolate version, which I felt contrasted better with the candy corn. The recipe uses 1 egg yolk, though I used a whole egg and added 2 more tablespoons flour and 1 tablespoon of extra cocoa powder. This may have affected the resulting cookies, as mine didn't have the pretty crinkled tops seen in the picture on the site, but that's alright because the taste was decent. Many of the comments for the recipe was that they had trouble getting 36 cookies. Well, when the instructions state to scoop out level teaspoons of dough, that means you take a teaspoon measuring spoon, a regular spoon, and scoop out level teaspoons of dough. Really doesn't take much time at all. These cookies are meant to be tiny little coins and that's part of the charm. For ease of handling, I didn't roll the dough into balls; rather, I scooped them out into roughly-shaped balls and plopped them on the baking sheet (the recipe doesn't state whether to grease or line the sheets, so to be on the safe side go ahead and line them with parchment, though I left the sheet ungreased and unlined and they came off fine). Preheat oven to 350 degrees. Place butter and sugar in a medium bowl; beat with a wooden spoon until combined. Beat in egg yolk, vanilla, baking powder, and salt. Add flour, and mix until a dough forms. Nice idea with the corn leftovers. I like how you went chocolate, it contrasts the color well. You believe its almost the holidays already? I'm not a candy corn gal, but these little cookies are too cute. By the way, thanks for the links on the doughnuts. I am going to see what I can come up with.